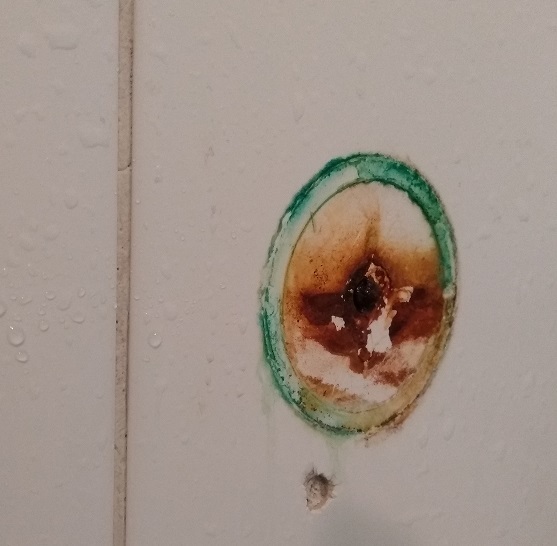 What's the best way to remove a rusty, broken screw from a tiled bathroom wall? The previous inhabitant of our apartment used screws which aren't rust-free in the shower. Now the screw holding our shower head rail broke off - or rather, just "came off" without any resistance. the upper part of the shower rail is still attached, so it's in "the perfect position"
That's just the best case though and might not be possible as I can't get a good hold of the screw with pliermy general question is what to do next?. You could try a screw extractor, i have had moderate success with them. 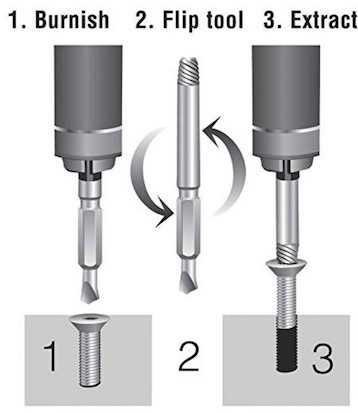 You use the first end clockwise to make divot in the screw so that the second end that turns counter clockwise will have something to bite its teeth into. Go slow and apply pressure into the screw. In your case the head is missing so it makes it very difficult but worth a try. The set does not cost to much and is good to have on hand anyways even it does not always work. Is there enough material of the screw shaft protruding from the surface to grip with pliers? You may be able to unscrew it that way. You could also convert the shaft into a slotted head. Use a small cutoff wheel on a rotary tool or thin hacksaw blade to cut a slot into the shaft. Use a flat screwdriver to unscrew. Both of these assumes there is enough structural integrity in the shaft to resist the force needed to unscrew it. if it is in a stud move up or down a bit and drill a new hole through tile and backer then a pilot hole into stud mount with a stainless steel screw. Wall tile is fairly easy to drill, even with conventional bits. I'd drill a few 3/16" holes around the screw to create access for a locking plier (Vice-grip). Clamp onto it and twist it out. Not the answer you're looking for? Browse other questions tagged bathroom walls tile screws or ask your own question. What's the best way to remove a wall plug? How can I fix an uneven and damaged transition from drywall to tile in the bathroom? How can I remove the tile from this wall? How to remove screw anchors from wall? What is the best way to repair and prevent cracking grout in a shower stall? remove sheared screw from electrical outlet box?